Xiaomi’s MIUI 10 update is finally rolling out this month, coming to everything from the Redmi 3S and Redmi 5A to the Mi 6 and Mi Mix 2S. It’s not the most significant update we’ve ever seen, but there are plenty of new MIUI 10 features. What makes the update worth downloading? Here’s look at some of the best MIUI 10 features you should know about. Portrait mode typically requires a dual camera setup in order to capture depth information and other details. But the past year has seen a trend towards software-based solutions with one camera, delivering solid results in the process. Xiaomi has previously used portrait mode on its dual camera phones, but one of the coolest MIUI 10 features is a software-based portrait mode for single camera devices. The company claims it has trained its portrait mode algorithms on more than 100,000 photos, so here’s hoping for quality snaps. You can find out if your Xiaomi phone will get portrait mode by clicking here. MIUI 9 marked Xiaomi’s first major foray into UI navigation for 18:9 screens, as it adopted swipe gestures for its full-screen smartphones. The new update continues this trend, as Xiaomi redesigns the ‘recents’ menu with tall screens in mind. The new recents menu offers a vertically scrolling list of running apps, making full use of the expanded screen real estate. You also have the ability to swipe on apps to delete them, or tap-and-hold on the apps to yield more options. In a move reminiscent of Samsung’s TouchWiz, Xiaomi has looked to nature to deliver notifications and other system sounds. The company says it’s using water droplet sounds for its alerts, adding that consecutive notifications will result in different droplet sounds. It’s meant to create a rhythm of sorts, which is pretty nifty, I suppose. Speaking of nature, one of the other notable MIUI 10 features is the ability to run a timer that incorporates nature-themed sounds as it counts down. These themes range from a forest and drizzle to night-time and fire. So if you need to unwind after a stressful day, this could help. It’s not one of the biggest MIUI 10 features, but the new volume/brightness sliders certainly stand out from other phones. Tapping the volume buttons will now launch the volume adjustment overlay on the right side of the screen (close to the buttons). This differs from many other skins, which deliver a volume overlay in the center or top of the screen. Both sliders also let you adjust brightness/volume by sliding your finger anywhere on the panel, instead of on a specific point. It’s a small, but welcome, adjustment. As Android has evolved, Google has gone to lengths to improve the speed and fluidity of the platform. Xiaomi’s MIUI has also made this a priority in recent releases, and the latest version is no different. 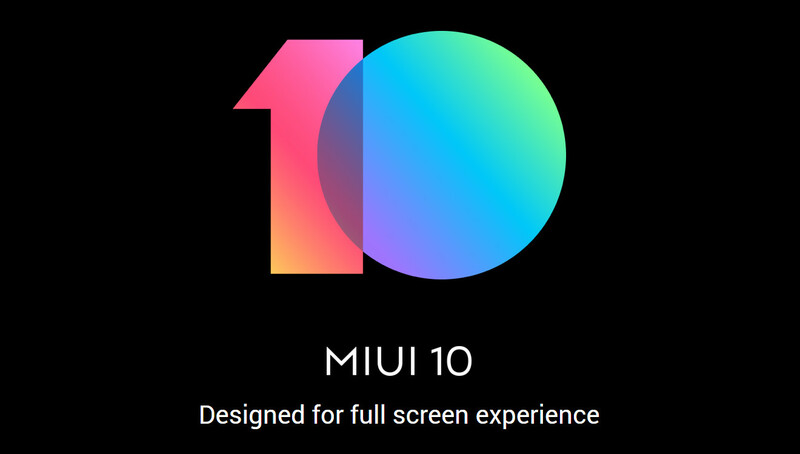 The company says it’s implemented two new MIUI 10 features to speed things up, in the form of “lock-free critical path” and “co-dependent prioritizing.” Whatever these features actually do under the hood, Xiaomi says the result will be a 10 percent improvement in processing speeds. Xiaomi is massive in India, coming in at number one for shipments according to at least one tracking firm. It’s not surprising to see region-specific MIUI 10 features, then. So what does Xiaomi have for the subcontinent? For one, there’s deeper integration with the Paytm app. 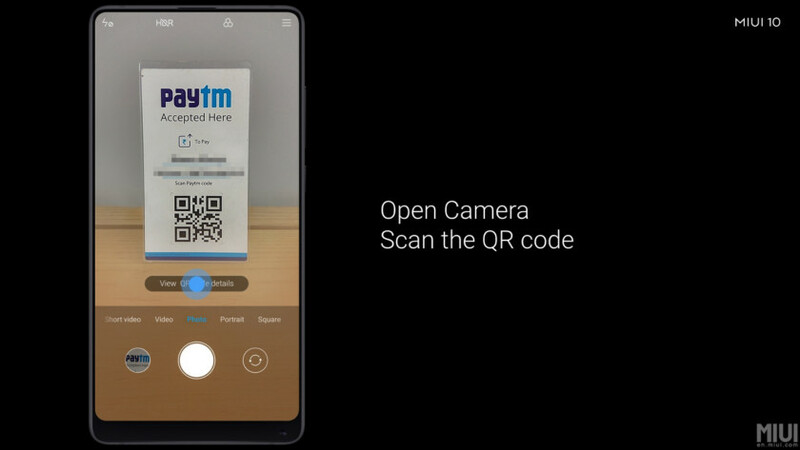 Now, scanning a Paytm code with the camera app’s QR code reader will launch the Paytm app to finish the payment process. Then there’s the addition of a local services page to the browser app, filled with services for Indian users. These are progressive web apps as well, so they should behave more like an app than a mobile website. Finally, we also see some neat app-linking functionality in Xiaomi’s SMS app. For example, the SMS app will prompt you to open the Flipkart app if you received your Flipkart order details in a text. I could definitely see Xiaomi bringing this to more countries — or Google adopting this for Android at large. Are there any features or tweaks you’re excited about? Anything we missed? Let us know in the comments section!